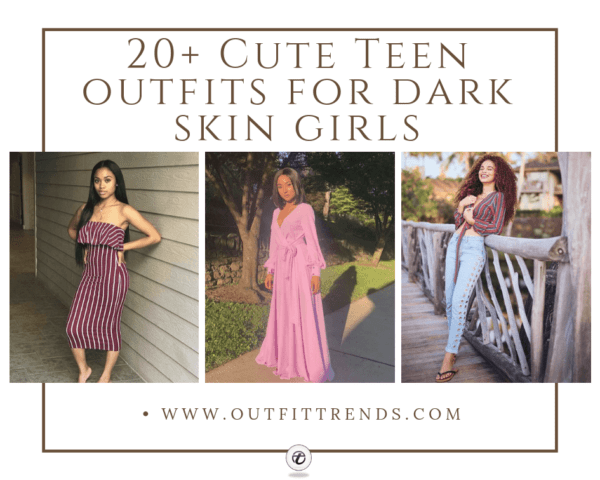 Cute Outfits for Dark Skin Teen Girls: Teenage years are all about exploring and finding your personal style while making a couple of fashion misses here and there. One major key is to opt for colors and styles that compliment your features and can be pulled off confidently. While we have grown up believing Snow White to be the epitome of beauty, we find Tiana and Moana to be no less. Celebrities like Zendaya, Beyonce, Lupita and many more tell us exactly how to own beautiful, dusky skin tones. Their bold fashion choices are inspirational and can be incorporated into your daily looks. As a teen, it becomes difficult to pick out outfits for different settings like school, college, hangouts with friends or dates. Here is a guide on some cute fashion options that can beautifully compliment a darker skin tone. Bold colors are flattering are highly flattering and should be worn with confidence. Tones of Blue and Red are especially loved. Camouflage prints are best pulled off by dusky skin tone girls and can be done in different ways. Black colored outfits are just as easy to pull off as whites. Cream and White colored outfits are known to make the darker skin tone appear bright and glowy. Keep in mind that the outfits need to look up-to-date with trends and youthful at the same time. Zendaya is one popular name when it comes to black celebrity teens. She has displayed her talent in ventures like Shake it up, Zapped and Frenemies. Her uber cool fashion style has earned her a special place among the best-dressed celebrities. Whether it was her Dolce and Gabbana dress at the 2017 Met Gala or her Metallic Outfit for the Heavenly Bodies theme at the 2018 Met Gala, her incredible style risks definitely paid off. Her unusual fashion outings are widely praised and received for her ability to carry them off effortlessly. While her red carpet looks have been about poise and elegance, her everyday looks are far from that. Zendaya keeps her everyday look casual and minimal. Her denim-on-denim look is perfect for dusky skin tones and can be worn to the school or out with friends. Also check out these 17 Ways To Wear Denim Jacket. We love how proudly dark skin girls are able to pull off bold colors like red and blue. The exaggerated sleeve trend is a simple yet elegant way to elevate a basic outfit. The trend is being done on both casual as well as formal wear adding a bit of volume to the top. Puff, bell, ruffles are all the currently trending designs and have been sported by celebrities as well. The red top has been nicely paired with a plain white bottom and is a great choice for a date. The choker necklace perfectly suits the low neckline of the red top. There is nothing like a good jacket to rock the streets in this chilly weather. The bright yellow is another great color for dark skin girls and also seems very youthful. Jackets have been the ‘it’ trend of 2017 and 2018 and do not seem to be going out of fashion any time soon. The black plaid bottoms seem to be neutralizing the brightness of the jacket while the red leather bag compliments both the colors really well. The back-to-school look is a great one and seems appropriate for teens heading to schools and colleges. Denim jeans are perfect for all skin tones and can be paired with different kinds of tops. Creating a cute date look can be a difficult task but not when you can pull out a basic pair of jeans and transform it entirely. Embellished denim jeans have been going around for quite some time now. After pearls, beads, and sequins come the metal rings that can be left on their own or laced up for a chic look. These denim pants can be paired with any blouse for a cute and trendy look. Dark skin girls find it difficult to choose the right kind of dress in terms of colors, prints and designs that best suit their complexion. This mid-length dress is a great option for a formal occasion. The plum color is a great choice for dusky teens and the stripes for a more elongated look. The vertical stripes are known to make a person appear taller. The slight frill on the body adds more detail and volume to the outfit. The figure-hugging dress is appropriate for formal occasions. The outfit can be paired with simple pieces of jewels and a nice pair of heels to complete the look. Do not fear bold colors and make sure to stock up on more reds if you have a dusky tone. The frilled red dress is a super refreshing one and appropriate for both Spring and Summer season. The square neckline is a unique one and can be styled with cute accessories. Moreover, the frills add dimension to the overall height with the added flare. Red has been flaunted by dusky beauties like Beyonce, Rihanna, Jennifer Lopez, and Michelle Obama who proudly own their dark skin color. If you like wearing red, you’ll love these 18 Chic Ways To Wear Red Outfits. For all the teens that are athletic and prefer dressing in their tracks, here is some inspiration to help you choose active wear. Whether it is a grocery run or a casual day at school, simple t-shirts and track pants or leggings are the way to do. We love how simple this white T-shirt is and how it has been paired with red tracks. The bold afro hairstyle is just what it needed for some more perfection. Channel out your inner swag with this all black look. There is nothing like a minimal black outfit that can be accessorized for a sleek look. Put together a basic black t-shirt with a plain black bottom to create one such look. While bright, popping colors like blue and red are perfect for dark skin tones, it is not a bad idea to wear black on other days. We love the little lace detailing of the heels that tie up to the bottom of the leggings. The metallic chains, little handbag, and block heels are all adding up to the coolness. Woo your friends over with a breezy Summer dress that reaches the toes. The green and white pattern appears cool and refreshing to the eyes, making it a great choice for the harsh summer heat. The loose ruffled sleeves add volume to the shoulder, while the belt holds the dress tightly around the waist. The light tone of green stands nicely against the dark skin tone and seems to be a flattering color choice. The overall look is super cute for teenage girls that are in need of a new and trendy look. It makes for a great travel outfit choice as well as something we would not mind wearing out to an afternoon party at the beach. This chic look has been put together with an oversized knit sweater and ripped jeans. The yellow adds a pop of color and makes the outfit appropriate for both Fall and Winter season. The slim-fit ripped jeans suit the oversized sweater well by letting the sweater hang loosely. The black boot heels neutralize the otherwise bright look, simplifying it for a chilled day out with friends. One highlight of the transition years between Teenage and Adulthood is the Prom night, an event all teen girls look forward to. This Lilac dress is a very minimal yet gorgeous outfit for a Prom night. We love how it compliments the dark skin tone, making it glow. The bow and statement sleeves make it just the right kind of formal outfit. The outfit can be paired with stilettoes and a tiny clutch for a more formal look. Funky and quirky looks are what Teens are all about these days. This graffiti print top and colorful bottom look super fun to wear. We love how youthful the entire look is, making for a cute hangout outfit. Dark skin girls should not fear away from bright splashes of color or even plain white. Any outfit worn with confidence is sure to win hearts. Here are Top 70 Fall Outfits for Teen Girls to Copy This Year. This oversized blue velvet sweater is a must-have. With the Fall season ending and Winter approaching, we cannot wait to wear something like this. Since blue is known to be a flattering color, add it to your everyday look with this one such look. It can be worn with white or black slim-fit jeans to compliment the over-sized sweater. The high boots are great to pair with the entire look. Lastly, the cat-eye glasses are exactly what the outfit needed. The outfit is appropriate for teens and we cannot wait to see velvet reigning this Season. Winters are all about bringing back velvet and leather which go back in the boxes as soon as winter ends. It has been seen on the runways, on streets, and on celebrities. The leather is usually done in forms of jackets or boots but the latest trend calls for leather pants. While difficult to pull off, quite literally, the trend has been the latest rage. It has been used to create another such monochrome look that we absolutely adore. The white neutralizes the otherwise all-black look and also compliments the dark skin tone. The outfit is perfect for black teens that are looking for a unique winter look. An all-white look can never go wrong especially when paired with a few black accessories to create a monochrome look. The casual white shirt and pant can be worn to school or college or can be accessorized for a day out with friends. White is one such color that brightens the dusky skin tone and can be worn in different ways. The black and white look is a classic one. The black accents like the handbag and heels do great justice to the overall look. Put together unused black and white items lying in your wardrobe for a cute youthful look. Bomber jackets have been the latest ‘it’ trend, featuring patterns, colors and customized writings. They have been sported by celebrities like Gigi Hadid, Hailey Baldwin, and Nicki Minaj, among others. Bomber jackets are a great way to make a style statement while staying casual and comfortable. Worn with a basic pair of jeans or leggings, they can create a cute and fun look of their own. This particular Bomber jacket is great for the Fall weather with its warm tones and insulation. The recent take on these bomber jackets involves camouflage prints, embroidered badges, digital prints etc. Here are 21 Best Leather Bomber Jacket Outfits for Women. Camouflage prints are known to be best-worn by black girls. The print is being done on jeans, jackets, shirts and even shoes. We love this particular camo pant in mustard-yellow color which has been paired with a black top and grey jacket. Any basic minimal top can be paired with a statement pant for a fancier look. The outfit is great for college parties as well as dates. The black boot heels perfectly suit the outfit and give an edgier look. Here is some inspiration for formal outfits to be worn by black teens. The sophisticated and elegant look is great for Prom night or Teen parties. College years are all about hanging out and making friends which means finding new outfits for each hangout. This white dress is a simple and graceful choice and something one should consider investing in. The outfit can be accessorized with bright jewels or a clutch for a fancier touch to it. The checkered pattern is one such trend that has been going around for years now. It has been done on shirts, lowers and dresses. We love how this dress incorporates the trend with off-the-shoulder sleeves. The light and cool color is appropriate for the Spring season and compliments dusky skin tone well. The cute outfit is youthful yet sophisticated. It can be accessorized with cute pompom sandals and a cross-body bag. It makes for a great back-to-school look. While we have spoken about bold colors, pastel colors like blues and pinks can also be worn by dusky skin teen girls. This all blue look is one such that can be replicated with ease. The outfit is a super elegant one and can be worn to college or out with friends. The front knot adds a different look to the top making it super cute. Keep in mind how the shirt color has not been matched with the denim wash as the discrepancy in the colors makes both the shirt and pant stand out. The shirt can be paired with a slim-fit pant like in the picture or with different types of denim jeans.